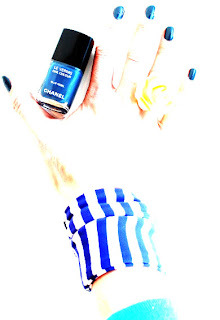 kandeej.com: Don't Sing the Blues- Spring the Blues on your nails! 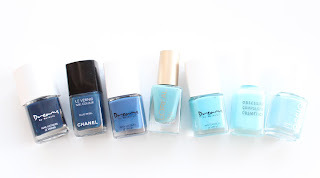 Don't Sing the Blues- Spring the Blues on your nails! I lined up a few of my blue nail polishes....and had to take a picture, because they looked so fun! I know for spring everyone's going to be talking about the same "spring colors"....but I say, tap your fingers to a different beat- the beat that isn't a "trend"! doesn't it just look like you want to jump in the middle of all the "pool-esque" blue-ness! I have been semi-obsessed with this dark, "color-of-jeans" blue from Chanel! It was a limited color for Fashion's Night Out called Blue Rebel- I didn't go to the Chanel event, but one of my friend's did- and gave it to me! And I love it! Blue on the nails feels fresh and kinda nautical- like I'm a sailor. And I can't think of a better way to sail through a sea of "trendy nail colors for spring"....than in blue! 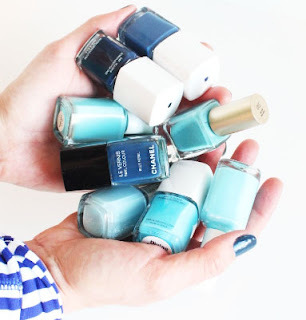 If you've never tried or though of blue nails, give it a coat and see how fun it is! Try either a very dark navy blue- it's as chic as a deep burgundy, but with a modern twist. Or the grey "stormy sea sky" blue, like the L'Oreal Now You Sea Me, it's a "chic blue-grey". Try a lighter sky blue polish, for a gentle blue that will be the perfect blue sky to your blossoming look! Go for the dark blue- it has the edgy look like a black- but with a pop of color that makes it a little fresher than a black or dark oxblood color. You can always add some nail design flair to make the blue you own! Anchors, stripes, gold glitter, or even a white tip would be fun! What's your favorite shade of blue? Hi kandee, dude ur my Fav * Anywho was just thinking if you would do a reasons why to or not to or legit or not legit. On the Mac makeup being sold in downtown LA at the Alleys. as we all at one point (even if your from out of town) check out the shops there. I recently found out they have been selling this stuff I think is expired stuff but you can't help but want to buy a few things. I don't just cause I'm to scared to put expired stuff on my face but just a thought since your a makeup expert and I'm a lover of this blog. This would be I think info alot of LAns would like to know. 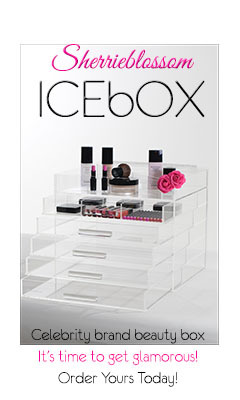 Just a inside edition kandee could do ??? Idk your call :) but love ya still! I love the Chanel one!